Artificial Grass has been shown to be a fantastic problem solver in a variety of different situations. One place you may not have considered using artificial grass is; around water areas such as swimming pools, marinas and ponds. At the water’s edge, it is inevitable that some water will splash out creating a slippery, muddy and damaged surface to walk on. Stepping out of a canal boat can often be difficult if the decking at the marina is wet and slippery. Also if children are playing near a swimming pool every precaution should be taken to reduce the likelihood of a slip or a fall. Artificial Grass can increase the level of friction on flooring, thereby reducing the likelihood of slipping. Long strips of artificial grass can be cut, which is perfect for fitting to marinas. It can also be cut into a variety of shapes to fit neatly around a pond. It’s even possible for artificial grass installations to include coloured graphics, making the swimming pool area even more exciting. Water + Mud + Children’s Feet = a Muddy Mess. – When kids get out of the pool and walk on grass, the culmination of wet feet churning up the grass means kids spreading mud around. One of the worst parts of a muddy poolside area is dirt getting into the pool. Swimming pools are designed to handle small amounts of dirt but excessive dirt and mud will result in very high maintenance costs. Artificial Grass is the perfect problem solver here; you can keep a lovely looking poolside area, with realistic looking artificial grasses, whilst completely eliminating mud. To make it the truly perfect solution to water edges, artificial grass requires no maintenance. It is durable enough to easily cope with the footfall and it won’t corrode from chlorine damage or be affected by sea water. 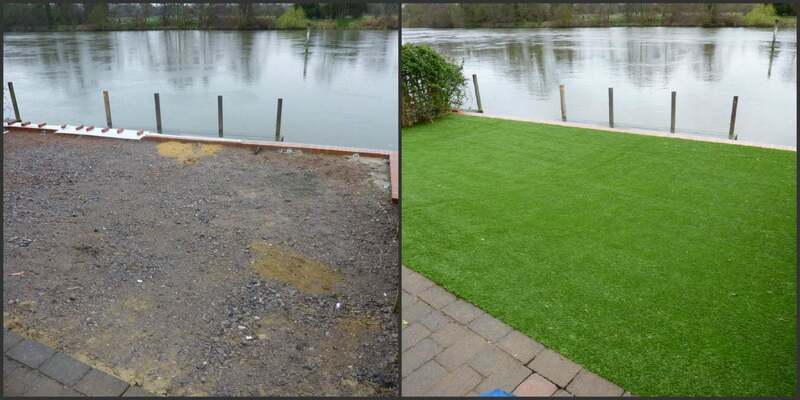 If you manage a water side area such as a pond, swimming pool or marina, you should consider artificial grass as it can really help to solve slippery, muddy and damaged surfaces.